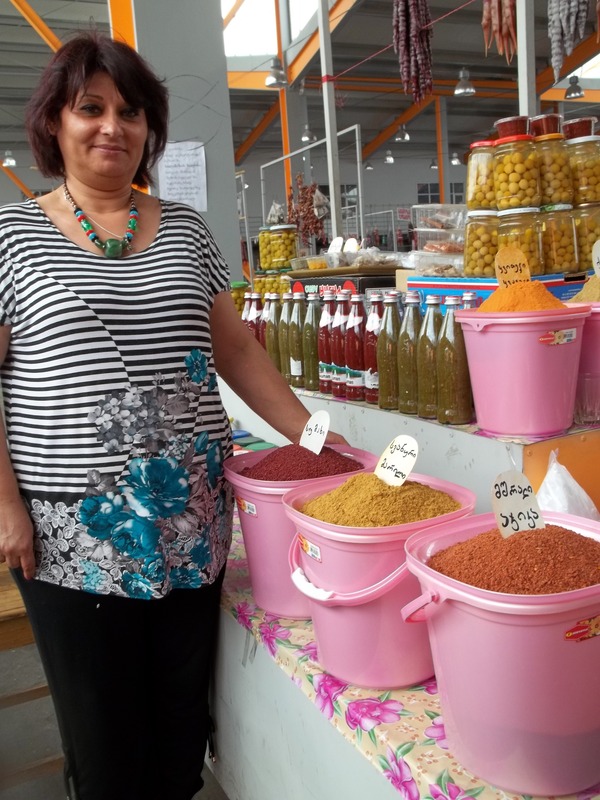 A tradition of home-cooked meals means that markets in Georgia overflow with a vast array of spices and herbs that give Georgian cuisine its rich flavors and aromas. 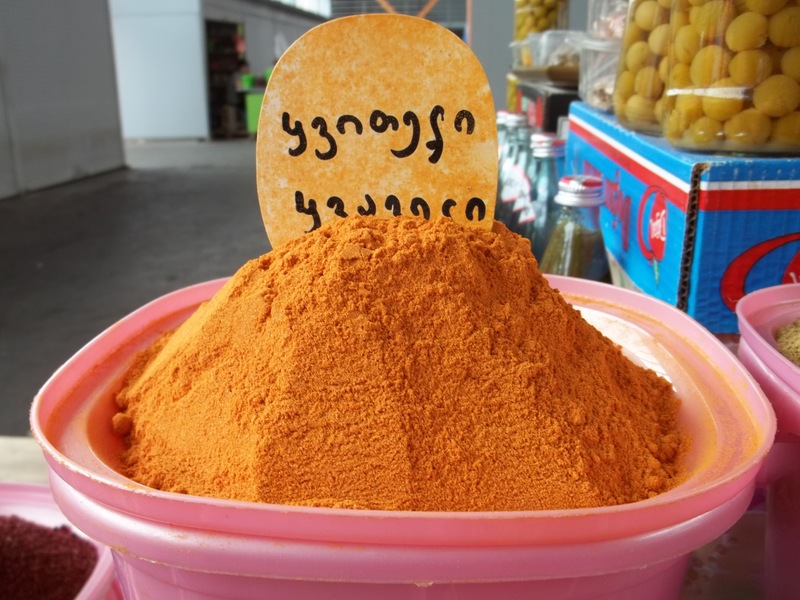 In this article we describe some of the spices and herbs that are most commonly used in Georgian cooking. We have included links to examples of our step-by-step photo recipes that use the described spices and herbs. 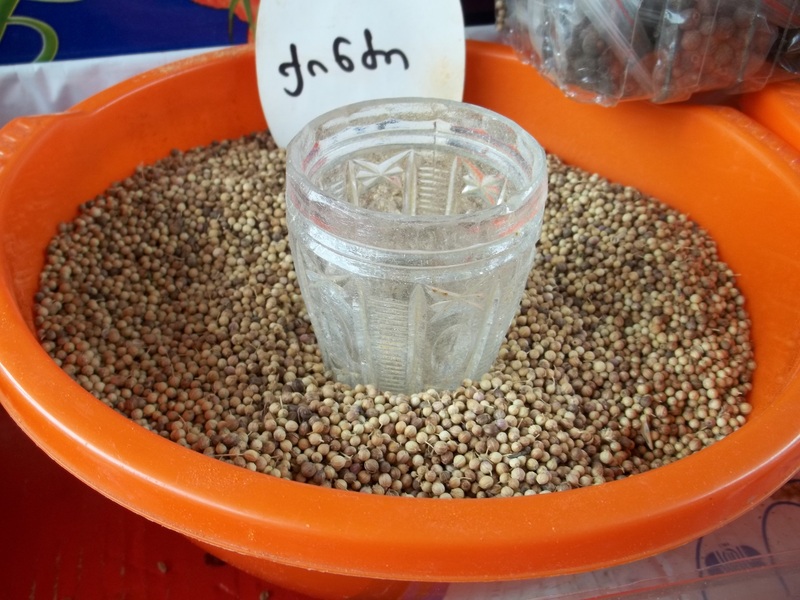 All parts of the coriander plant (Georgian: ქინძი) are edible, but the fresh leaves and the dried seeds are the parts most traditionally used in Georgian cooking. Georgian recipes that use ground coriander seeds include: Tolma (Georgian: ტოლმა) – a filled, hollowed-out vegetable or a filling wrapped in a leaf; and Chicken Liver Chashushuli. Blue fenugreek (Georgian: უცხო სუნელი) grows wild in the mountainous northern part of Georgia and is widely used to flavor food. 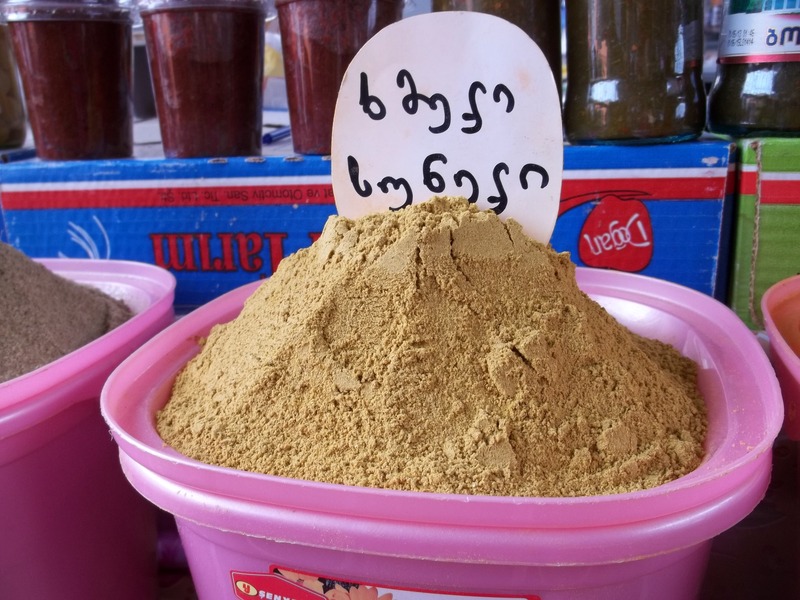 In Georgia it is called utskho suneli or foreign spice and is prepared by grinding together the seeds and pods to yield a tan powder that is aromatic and mildly spicy. Georgian recipes that use blue fenugreek include: Kababi; and Khabakhi (Georgian: ყაბაყი) – zucchini fried with vegetables and spices. The berberis plant (Georgian: კოწახური), commonly called European barberry or simply Barberry, grows wild in Georgia and produces large crops of edible berries that are rich in vitamin C. Ground sumac, which is available in Middle Eastern food stores may be substituted for dried berberis in recipes. 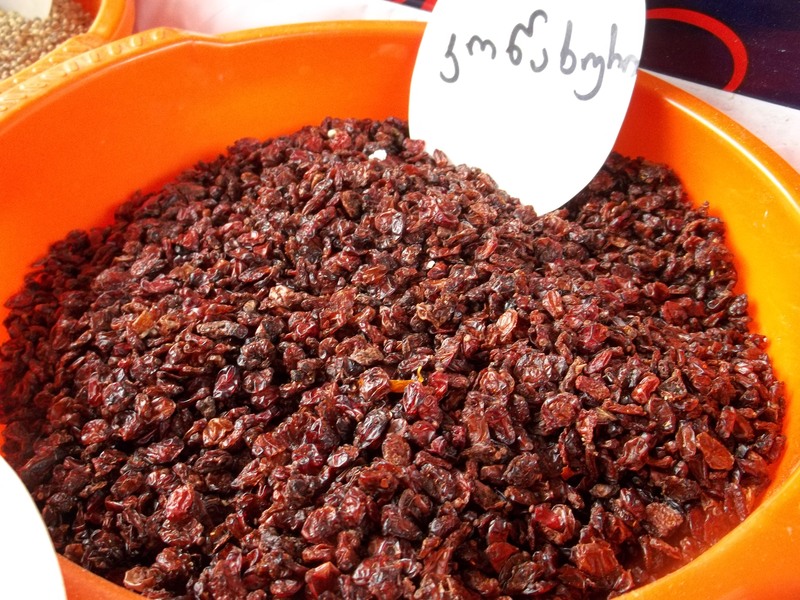 Georgian recipes that use dried berberis include: Ojakhuri – pork with potatoes; and Barbecued pork with red onion. 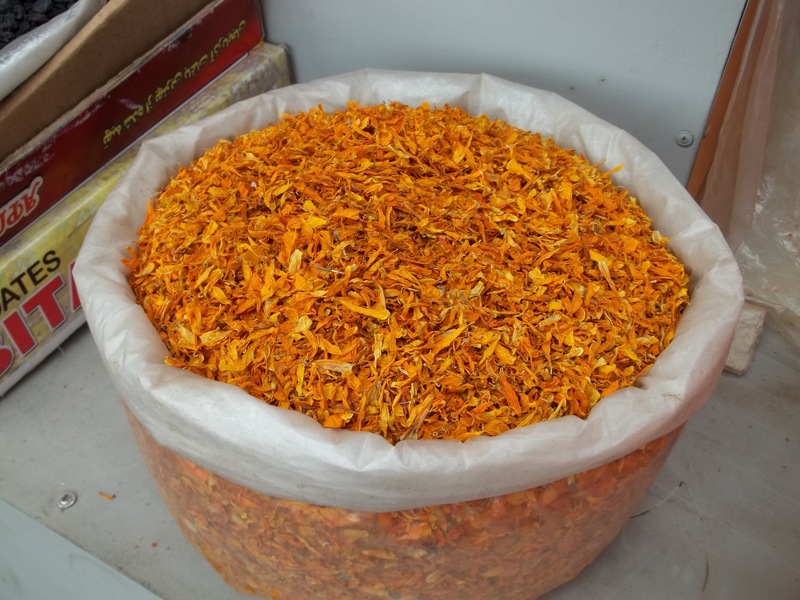 Georgians use the dried and ground petals of the marigold (Georgian: ყვითელი ყვავილი) to give an earthy flavor and color to walnut dishes and sauces, such as bazhe. Georgian recipes that use marigold include: Walnuts and spices wrapped in cabbage leaves; and Eggplant with walnuts and spices. Caraway (Georgian: ძირა) is a favorite ingredient in dishes originating from Georgia’s mountain regions. The seeds can be ground in a coffee mill or spice grinder to produce a powder. Georgian recipes that use ground caraway seeds include: Khinkali (Georgian: ხინკალი) – a very popular Georgian dumpling. 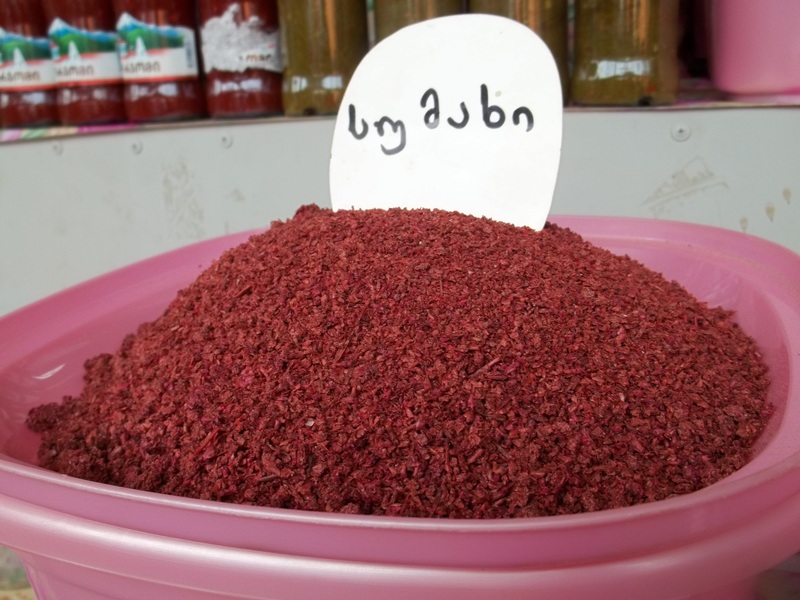 Dried Ajika (Georgian: აჯიკა). 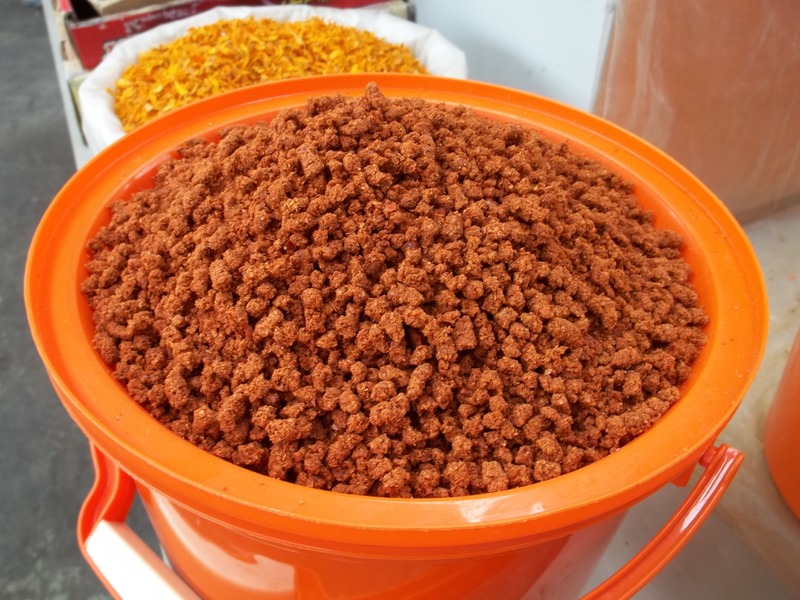 Ajika is a hot, spicy paste used to flavor meat and fish dishes mainly in Samegrelo and Abkhazia. It is made with hot red peppers, garlic, herbs and spices. In appearance and consistency ajika resembles Italian red pesto. 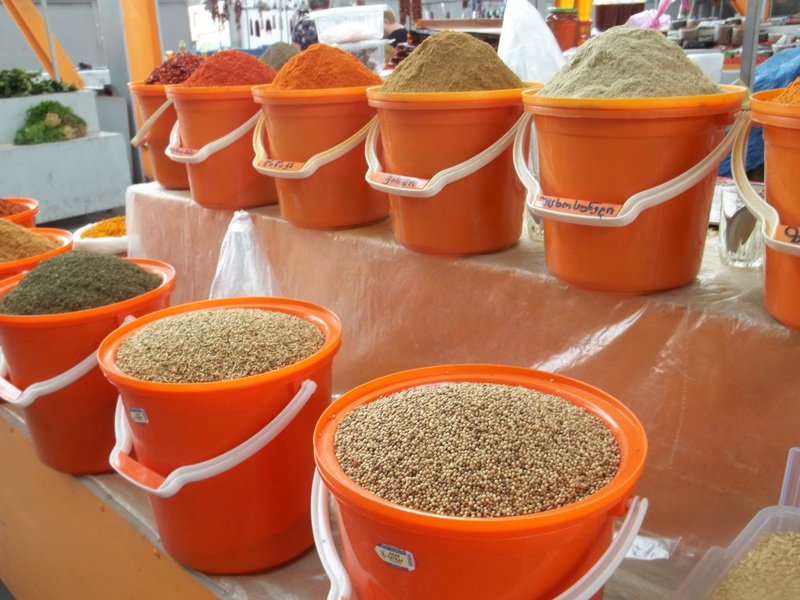 In its dried form it is used to flavor meat and vegetables. 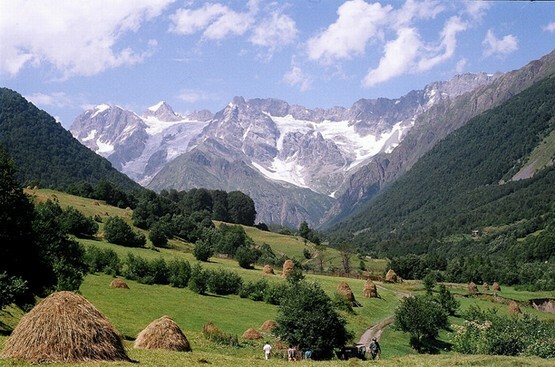 Svanetian salt (Georgian: სვანური მარილი), from Svaneti region in the mountainous north-western part of Georgia, has a unique fragrance and taste and is traditionally used as a flavoring for a variety of meat, fish, potato and soup dishes as well as a condiment instead of table salt. The salt mixture is handmade in a special wooden mortar from a minimum of 8 ingredients, including regular salt, garlic, marigold, coriander and blue fenugreek. To prepare 1 kg. of Svanetian salt takes several hours of mixing. 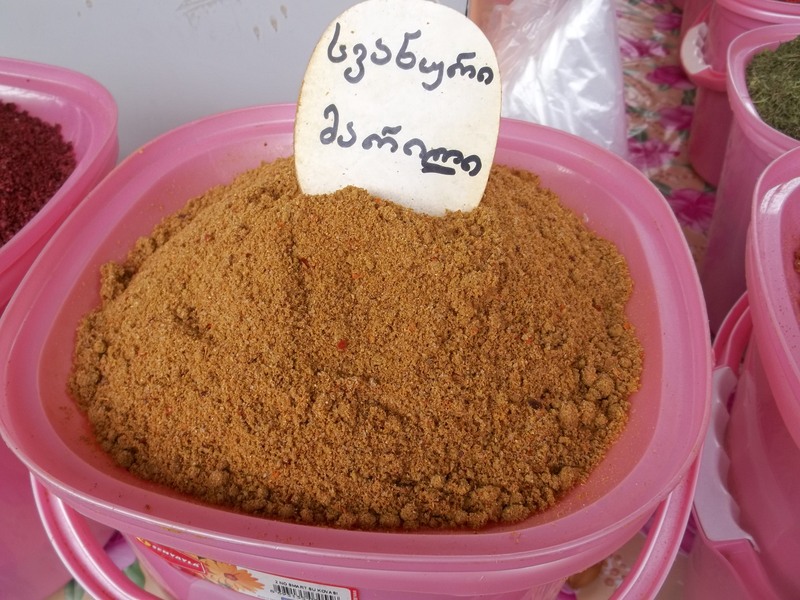 Megrelian Salt (Georgian: მეგრული მარილი), from Samegrelo region is very spicy and much hotter than Svanetian salt. Two types of basil (Georgian: რეჰანი) are used in Georgian cooking, the green leafed variety and the purple leafed dark opal basil. Both fresh and dried basil is used. Georgian recipes that use basil include: Mushroom Chashushuli and Green Bean and Egg Bake, as well as salads. 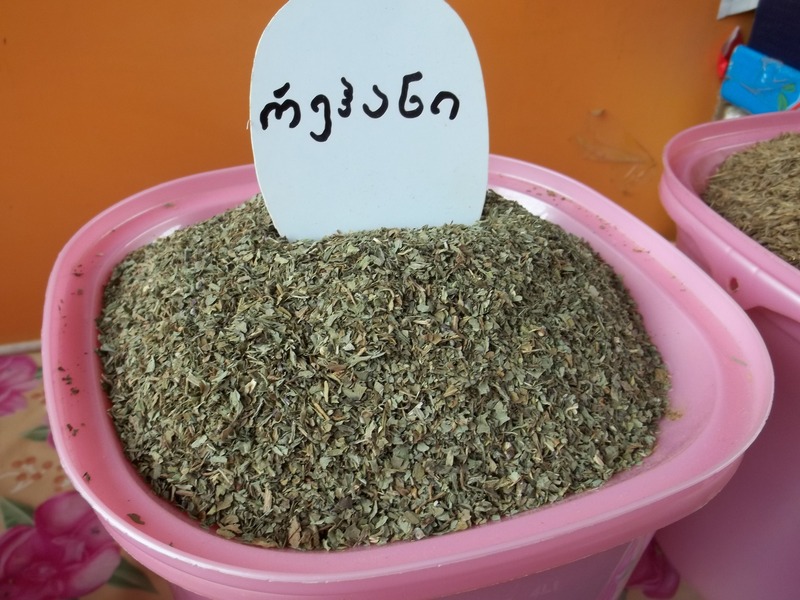 Fresh and dried Summer Savory is used to flavor meats and vegetables. Georgian recipes that use summer savory include: Tkemali (Georgian ტყემალი) sour plum sauce. 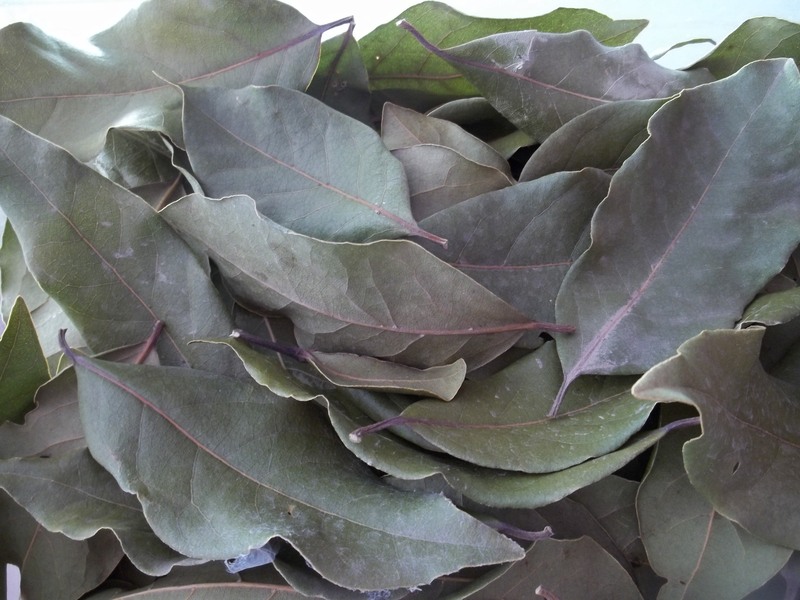 Dried Bay leaves are extensively used in the preparation of meat dishes, especially pork. 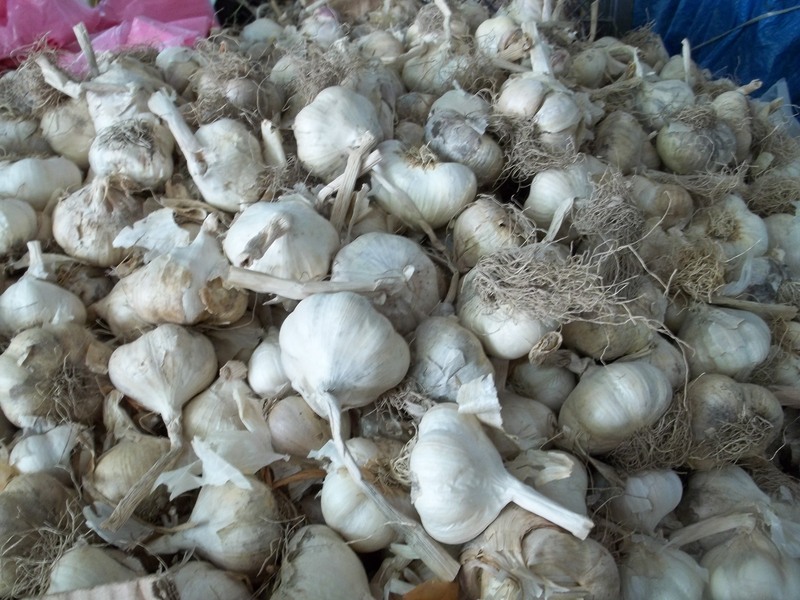 They are also used in marinades and in cooking some vegetable dishes. Georgian recipes that use bay leaves include: Lobio (Georgian: ლობიო) – a popular dish made with kidney beans; and Lobio with nuts (Georgian: ლობიო ნიგვზით). In Georgia, garlic (Georgian: ნიორი) is a fundamental ingredient of many recipes, such as Shkmeruli (Georgian: შქმერული) – chicken dish from the Racha region; Chakapuli (Georgian: ჩაქაფული) – a popular Georgian stew made with lamb or beef; and Ham Chashushuli (რაჭული ლორის ჩაშუშული). 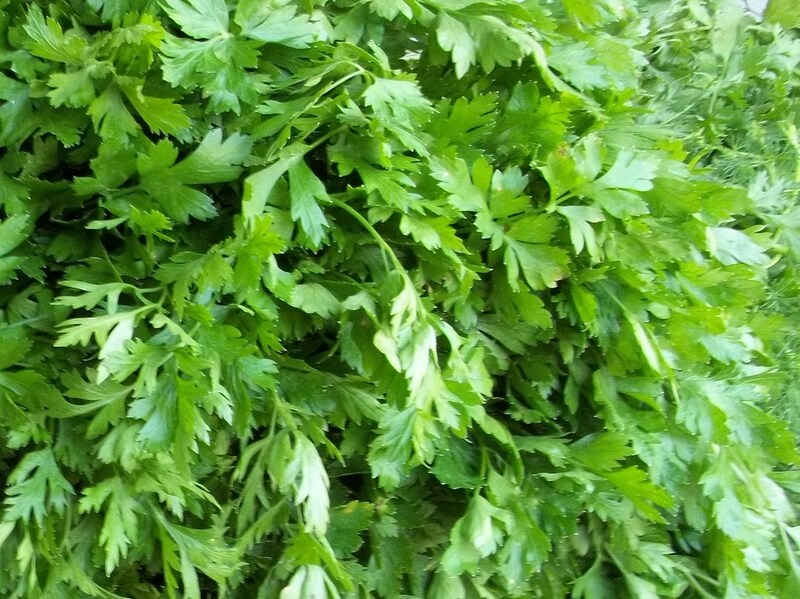 Fresh parsley is widely used in Georgian cuisine, both as an ingredient and as a garnish. Georgian recipes that use parsley include: Eggplant with spicy mayonnaise (Georgian: ბადრიჯანი მაიონეზით). 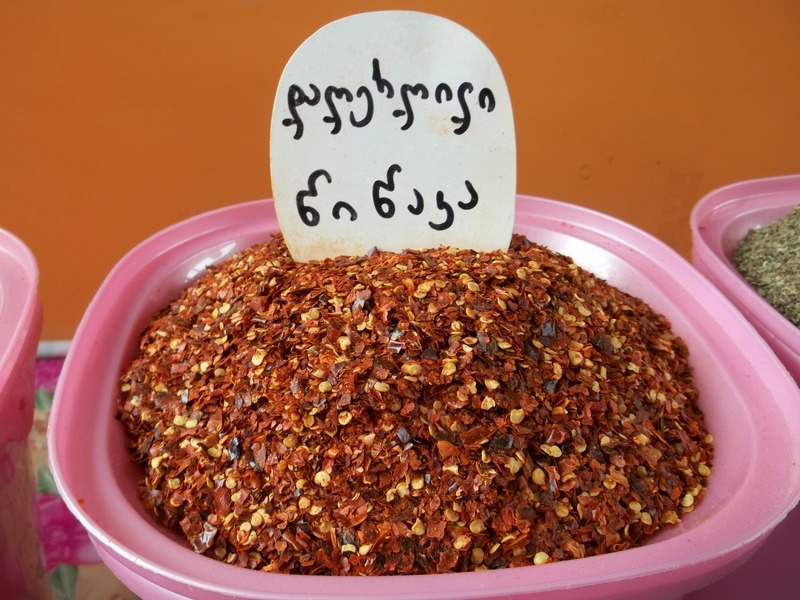 Georgian recipes that use dried hot pepper include: Chakhokhbili (Georgian: ჩახოხბილი) – chicken with herbs; and Tolma (Georgian: ტოლმა ბულგარული წიწაკით) – stuffed peppers. 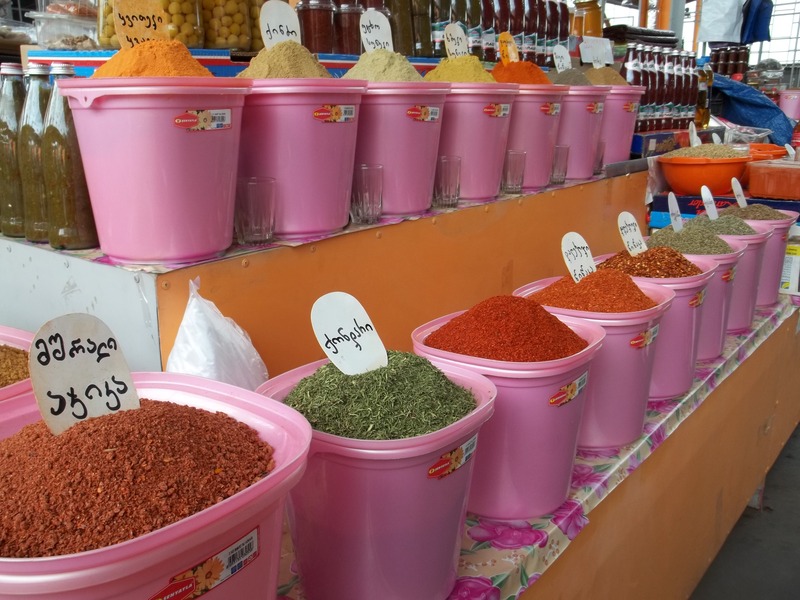 Other popular spices and herbs used in Georgian cuisine include mint, cloves, nutmeg and mace and cinnamon. 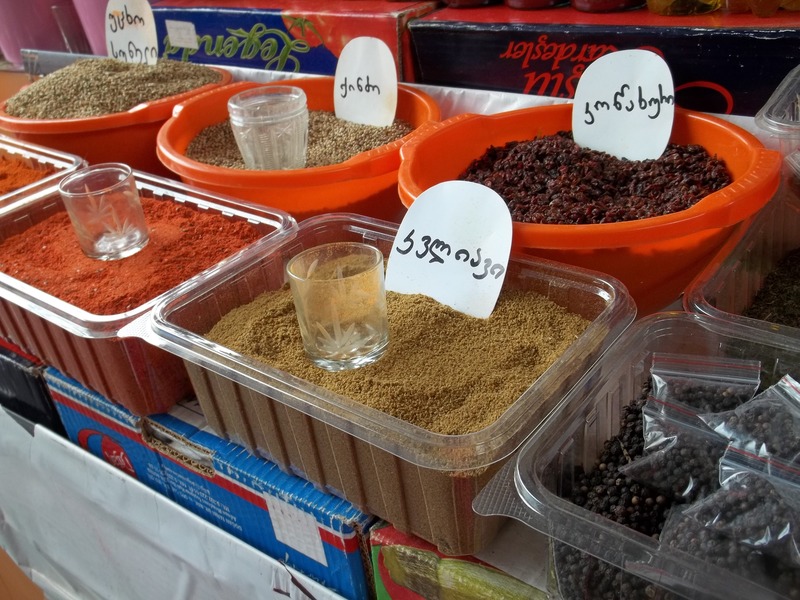 Use traditional spices and herbs in our Georgia About recipes and enjoy authentic Georgian cuisine! Love, love love this post. Lovely photos – and DELICIOUS! Ok. I am Georgian and did not know all these names myself. Thank you for this beautiful post! Hi! First of all I want to congratulate you for the great job you are making with this site! All the recipes I tried, to date have been largely approved my georgian firends, and I know they are quite severe regarding food! 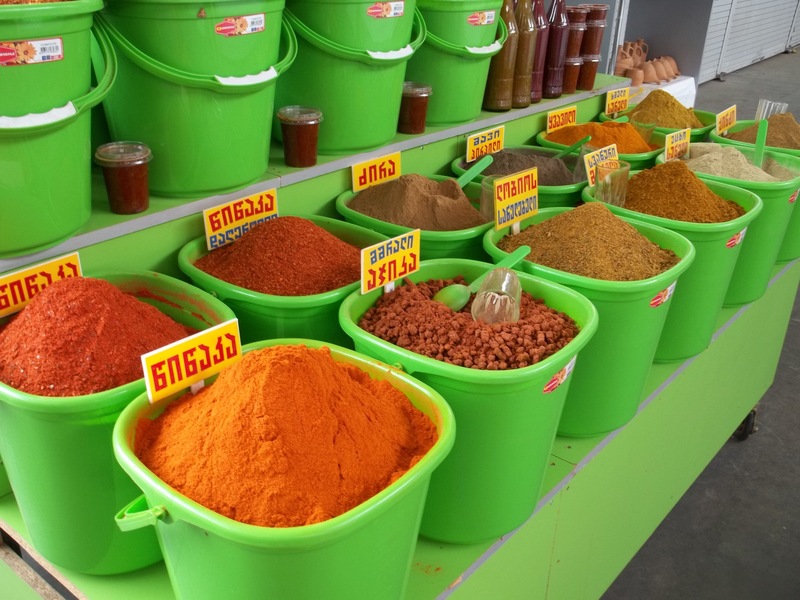 I think that there is only something that should be clarified (and probably corrected) in this post about georgian spices. 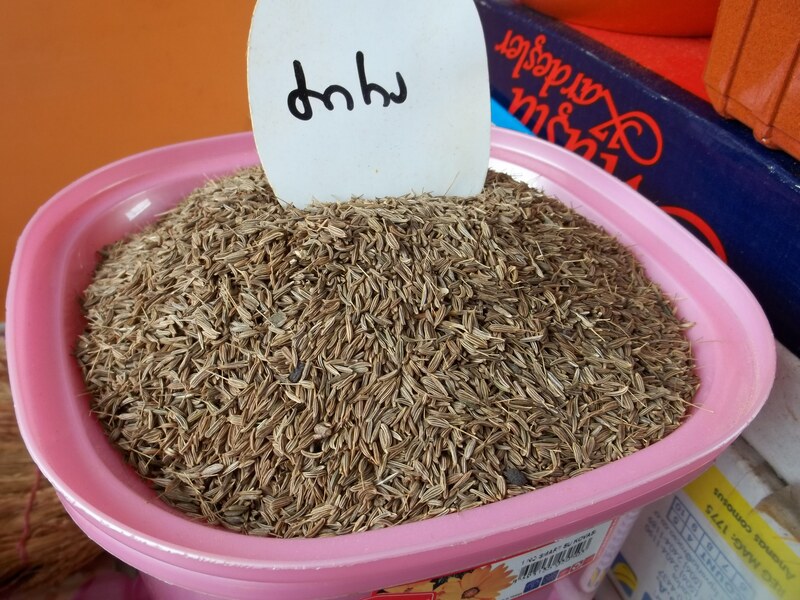 In georgian cuisine “caraway” is never used and as a matter of fact I never saw it at the local bazars in Tbilisi or other regions of Georgia (I found caraway only at an international supermarket). 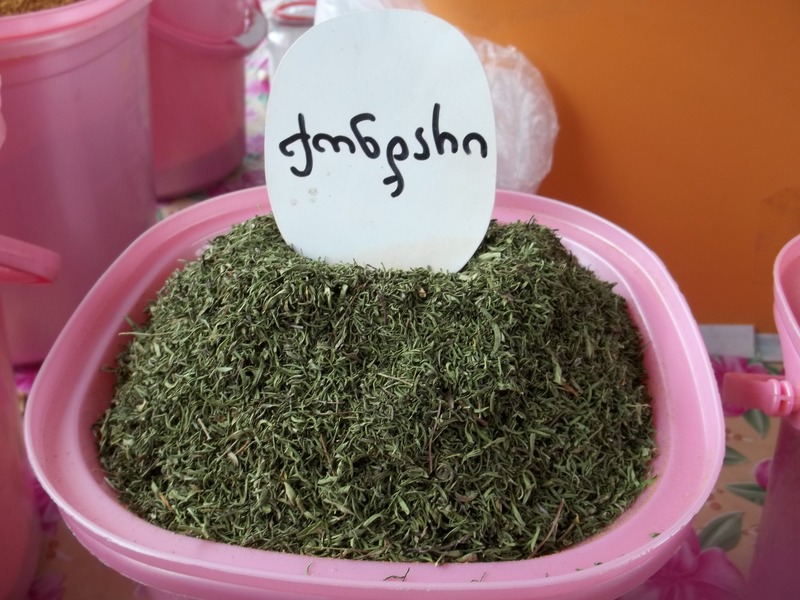 Instead, what is widely used is Cumin (which is actually ძირა, “dzira”) and as I understand there is not even a specific georgian word for “caraway”. Both Cumin (Lat. : Cuminum cyminum) and Caraway (Lat. 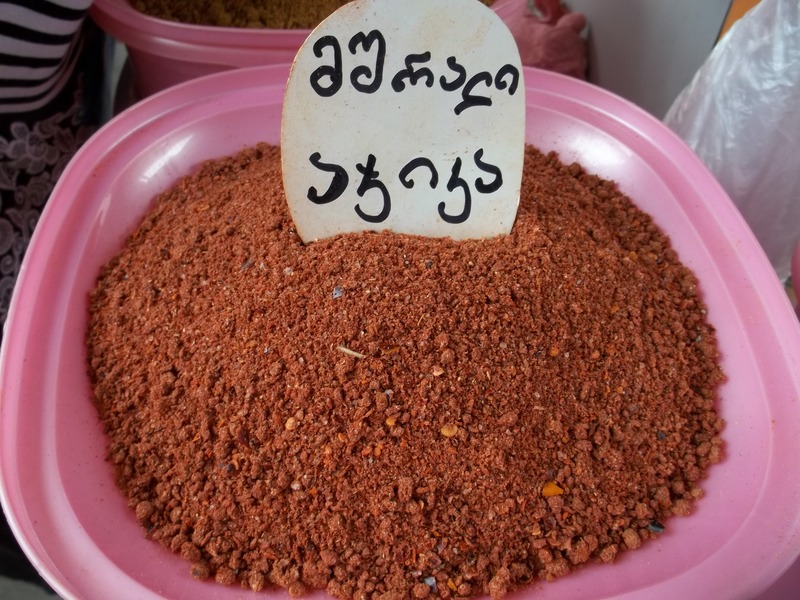 : Carum carvi), in fact belong to the family of Apiacaee but they have really different flavors and actually I’ve never eaten, for example, khinkali with caraway. Of course this is not a critiic, but a simple suggestion! Thank you. I have amended the post. This is backwards. 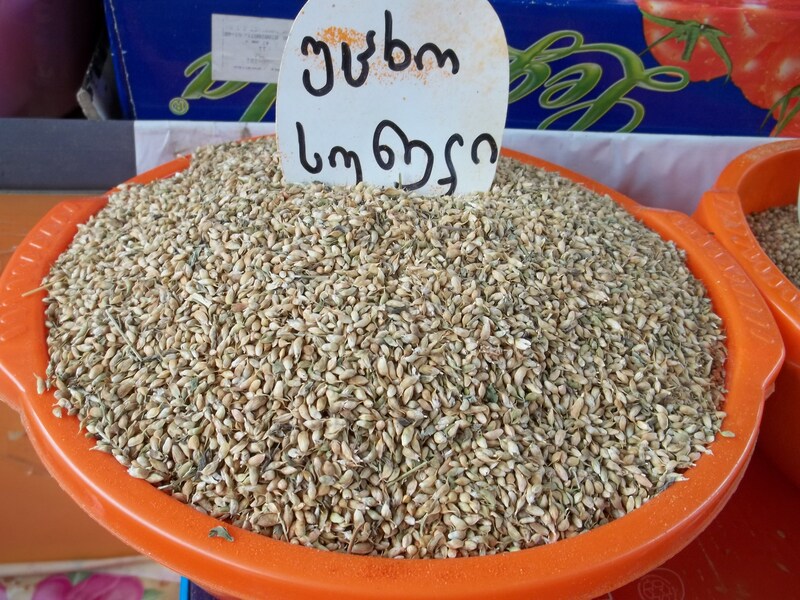 ძირა is caraway and it’s cumin that is never used in Georgian cooking. Just go to Carrefour and look at the bilingual spice labels. Or, you know, buy some dzira and taste it. It’s nothing like cumin.